Have you ever started out on a project that became, um, a bit too ambitious? Well, this week, I did, when I started to make my first statement necklace. I really thought I was ready for the big time. After seeing lots and lots of designs, I was armed with a vision – big pearls, chains and small crystals, sort of a hopped-up Chanel-inspired piece. Then I sat down with my beads and design board, and something was amiss. The pearls were too big. WAY too big. Then the flowers I was thinking about were a bit too Springy. I wound up with the piece to the left, but I am going to try a few more things with it, including some hand knotted silk (or silk-ish – to keep costs reasonable) thread. 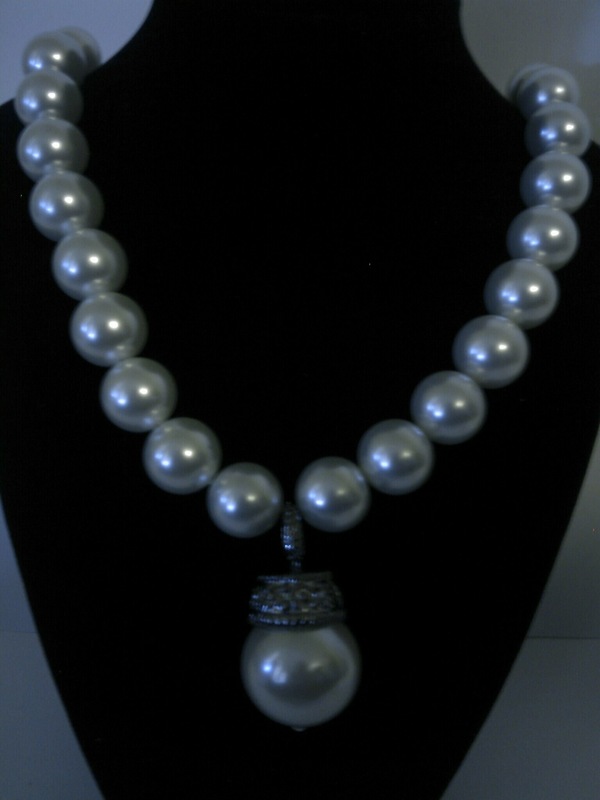 Little A really likes the pearls the way they are, so I may have to make a smaller version for her. Bad News for your iPod. Very pretty! I want to try knotting also. Just haven’t tried it yet lol. So far crimp beads are easier lol. So let me get this right…..THAT ONE UP THERE in the picture is a mistake right? That means it’s flawed right? I’M CALLING DIBS ON ALL MISTAKE STATEMENT PIECES RET NOW! Can you make some flawed earrings to match please and immediately forward to me so I can wear em when fall starts. *mumbling* she up here showing a MISTAKE that look better than the ish they selling at Nordie’s. Big Sister Gorgeous One got me confused…..hmph. smh. It is a mistake and you might have to fight Little A over that one, cause she was eyeballing it REAL closely while I was making it. Tell her I’ll give her something sparkly! LOL THAT ONE IS MINE!